Review : Excellent Amplifier drives my entire house all 16 speakers with clear clean audio. Review : Everything good except the remote - bad out of box. Review : GREAT PRODUCT! It looks nice and sounds good; but the lighted control buttons are really fragile. Care must be taken when packing. The connection between the buttons and the switch were broken during my moving and I am now looking for a replacement. I hope you enjoy yours and be careful because It does last a long time. Review : Audio and video quality and features are excellent. More bells and whistles than I expected. Review : Love how you can control the subwoofer separately. Review : Very good quality stereo everyone should have one. Review : i am very pleased with the appearence and performance of this product. Review : Awesome amp at an awesome price. Great separation and fullness in the sound and DVD player is quite the bonus. Review : Outstanding technical product sporting 1000/3000 Watts of power. Includes receiver and input hookups for virtually anything. Review : ustomer Review great product! great price!, January 29, 2013 By Mr. Randall E. Starman "STARSHIP" Amazon Verified Purchase(What's this?) 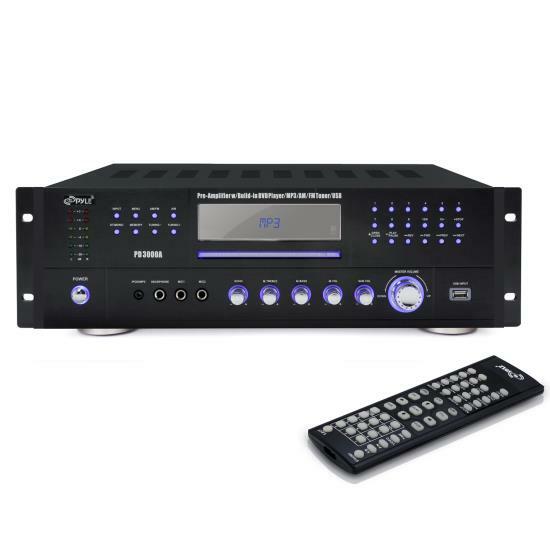 This review is from: Pyle Home PD3000A 3000-Watt AM-FM Receiver with Built-In DVD/MP3/USB (Electronics) What a deal, works well. Priced extremely well. I decided to give it try and Im glad I did, I will be buying more Pyle products. The amp is clean and kicks! The display is simple and to the point and colorful. Dvd too, a bonus. Don't miss this one. Review : System is OK customer service is bad. Had system less than a year remote went out took 3 months of fighting to get another one. Finally got one still does not work they do not care, sent a bad remote. Review : LOOKS NICE,GREAT VALUE. I HAVE USED OTHER PYLE PRODUCTS IN THE PAST WITH GREAT SUCCESS. HAS A GREAT SOUND WITH THE RIGHT SPEAKERS THATS A MUST. THANKS.